If anyone understood the American working man or woman it was Studs Terkel. He listened and talked with them. Didn’t matter who they were, what they did, famous, infamous, or just another face in the crowd. The author, journalist, activist, historian, and radio host died today at the age of 96. Studs was always about keeping it real. Working: People Talk About What They Do All Day and How They Feel About What They Do is perhaps his best known book which was adapted into a Broadway musical by composer Stephen Schwartz in 1978. Though “Working” wasn’t a Broadway hit, the book has been a classic text for the study of 20th century American History. And Schwartz’s musical still remains popular on the high school college musical circuit. Here’s a clip of “Millworker” from the PBS “American Playhouse” production with Eileen Brennan. Studs’ signature raspy voice gave any joint or interview instant atmosphere and what could be a better combination than Studs talking with musicians. He loved jazz and the Blues. Check out this video with Chicago Blues pianist Blind John Davis, recorded in 1985. More of Studs Terkel’s interviews can be found at the Chicago Historical Society – Studs Terkel: Coversations With America. 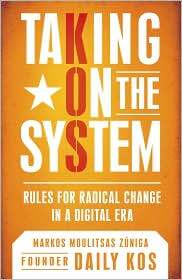 And Taking On the System: Rules for Radical Change In a Digital Era by Markos Moulitsas Zuniga aka founder of Daily Kos. Actually, this is my introduction for this week’s Community Organizers Hall of Famer: Markos Moulitsas Zuniga. Granted, I’m sometimes the last to know things and sometimes the first to figure things out. 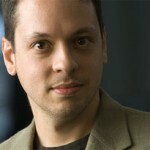 The blogger Markos or “Kos” as he’s known among army buddies and the blogsphere founded the Daily Kos in 2002. I added Daily Kos to my daily even hourly reading in August after several emails were forwarded to me from Kos diarists admonishing and setting political newbies (like me) straight during our freak outs over polls, election predictions by MSM, and other swinging tires that were just part of the routine for the pros. But don’t assume that means they take politics lightly. I am progressive. I am liberal. I make no apologies. There it is. Like it or not, you know where he stands. Markos said he founded Daily Kos for one simple reason: “I felt ill-served by the undemocratic gatekeeping mentality so prevalent in our society.” A bit-o-bio: Marcos grew up in El Salvador. At age 9 his family fled the country to avoid its civil war. He joined the United States Army in 1989 and served in the Gulf War. He says he entered the army as a Republican, but emerged a Democrat. Daily Kos has created a community, but Markos isn’t the HBIC (Head Blogger In Charge) of this community. He’s the guy with the tool box building, tinkering, welding – making the new technology into a platform for people to connect, coordinate, and yes, fight for the change they believe in – cultural, political, and environmental etc. This is not to say they haven’t had a few skirmishes on-line between Daily Kos, it’s editors, and subscribers. The primaries with the Clinton-Obama contest in full swing got a bit brutal on-line. Some abandoned the blog. [I’m not sure if they’ve returned. I wasn’t reading it daily it at that time.] But nevertheless, Daily Kos and community remain on schedule and on track. The Daily Kos analysis of the polls and stats are unbeatable. If they can’t do it, Daily Kos’s references to other numbers crunchers like Nate Silver of www.fivethirtyeight.com or www.pollster.com are your better bet. But the Kos analysis lets you now who’s screwing up (polls and candidates), who’s moving ahead, and who needs to just get out of the way across the board. “Change without conflict” doesn’t neatly apply to everything like who gets to hold the remote, but change is work. Hard work. Change can stir up trouble. And in my life-long civilian observations I’ve seen and learned that “Change doesn’t come easy.” Someone who’s able to organize people around principled ideas, using resources at hand – computer and modem — not asking permission or approval from gatekeepers and actually making things happen can’t be ignored by friends and foe alike. Markos has provided a platform for people who actually aim to get things done. It’s not the top-down approach; besides netroots really doesn’t work that way. The stats on Daily Kos: Daily Kos attracts 2-4 million daily visits. 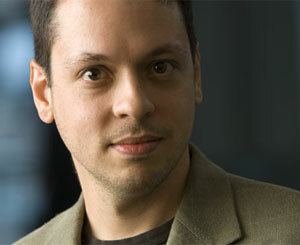 Markos is a regular columnist for Newsweek, and The Hill. People en Espanol named him among the “100 Most Influential Hispanics,” and he was third in Forbes magazine’s “Web Celeb 25,” and ranked 26 in PC World’s list of the “Most Important People on the Web.” And he has a J.D. from Boston University. But Markos appears to be an eclectique citizen – he plays the piano (when he can) and composes music (when he can). http://www.dailykos.com/special/music. Martha, Howard, and Markos. Who’d thought this would be my island trio. People who know me, know I admire a good principled fighter. There’s no one style or standard for fighting back or onward. These fighters are not perfect people. [Though Martha aims to achieve it.] They are unashamedly committed to their principles, purpose, and will tweak when necessary. I’m about to go into my second reading of Markos’ Taking on the System. I refer back to Martha’s Rules which I read before I went self-employed; and Meditations is a constant. On this island I am not alone or stranded. To Love Life truly is to be whole in all one’s parts; and to be whole in all one’s parts is to be free and unafraid. Apparently, someone’s trying to trip up first-time voters in Virginia with a flyer scam: the phony State Board of Elections flyer reads Republicans vote November 4 and Democrats vote November 5. (Third parties were omitted.) The flyer was spoted in Hampton Roads. First of all, we know election day for all parties is November 4th. Right? There will be a quiz. Second, the author(s) of the flyer apparently is transparent about letting us in on their political leanings. Even though I’ve never missed a major election since the day I registered to vote at age 18. (I did miss one local initiative special ballot – I’m so ashamed), I can see how the state-by-state rules and regulations can be a daunting experience for the first-time voter especially if you are a first-time voter/citizen from a country where the registration and voting process is a whole lot less complicated or you don’t have any voting rights at all. I guess this latest shimmy sham reflects what my 87-year-old aunt and native Virginian from Fairfax County said to me this weekend: “What’s happened to McLean? It’s turning blue.” It’s not a problem for her, but apparently it seems to be a problem for somebody. Over the past several weeks I’ve been sharing Voter Updates with friends and family on my personal distribution list with the intention of getting the world out about Voting rights and Protection. The Eclectique Citizen is now part of this blog with the intention of making the information more available. I do verify web links etc. before posting. 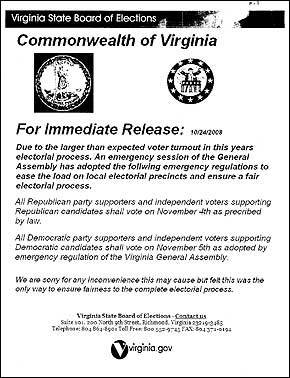 Update: Re the Straight Party or Ticket Voting information. What is reflected below applies to NC only. Best to contact your state Election Board to download or request a sample ballot and ask about this feature. Or check this link for the National Conference of State Legislatures. Not all states have the Straight Party Voting option. The link will tell you more. We’re in the final week of what can best be described as one of the most historic and important elections of a lifetime. The elections of 2000 and 2004 have produced much more information about voting suppression and voting rights. I’m one of those people who has trust issues with electronic or touch-screen voting. Call me old school, and yes, I still write paper checks. But there’s something about having physical evidence or a paper trail that gives me a sense of legitimacy. Here is a site where you can find out if your state has electronic voting or both electronic and paper voting options. Early voting is discovering some of the voter machine “glitches.” Nevertheless, if you have any trouble voting (early or on Nov. 4) or suspect any kind of problem at your polling place that prevents you or any person from casting a ballot, call 1-866-OUR VOTE (1-866-687-8683). Add this as a speed dial on your cell phone. TO DO THIS WEEK (Recommendations):– If you have not voted yet (early voting), verify your voter status and location of your poll – www.canivote.org. Visit www.866ourvote.org to find your State Board of Elections. – Assist relatives, seniors, and friends verify their status and their options re voting early or absentee. Download or get a copy of a sample ballot and review the ballot with them (review it for yourself). Remember my Recommendation re the STRAIGHT PARTY VOTE. If you have a STRAIGHT PARTY VOTE ballot, skip the Straight Party section and take the extra time to mark each contest separate starting with the PRESIDENT/VICE PRESIDENT box. A STRAIGHT PARTY VOTE does not apply to the Presidential election; only local/state elections. Other voter rights groups are recommending this as well. – Inform your employer or staff when you plan to vote and allow yourself 3-4 hours in case of long lines during peak hours – usually early morning. You have the legal right to take time off to vote. For managers and employers, I’d suggest including this as an agenda item in your next staff meeting re staff time, leave policy, and coverage on November 4. – If you don’t have a state issued i.d. (driver’s or non-driver’s license), get one! If you have a relative or friend who doesn’t have one, and is registered to vote, be sure they get a state issued i.d. before November 4. It’s a good thing to have overall. 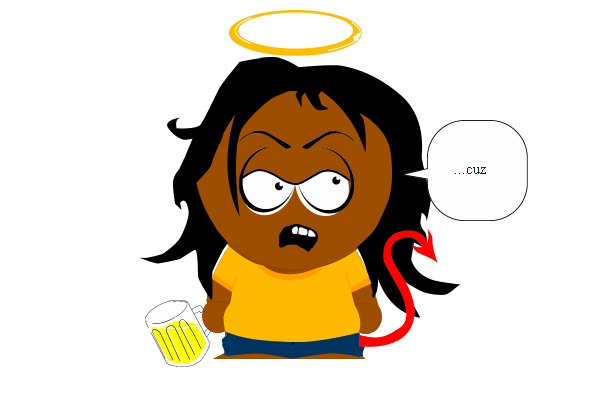 Months ago I created my own South Park persona. It’s an interesting exercise in “know thyself.” I think this character emerged in the heat of the primaries. I didn’t get to visit the real South Park while I was in Colorado.